Pooper scooper businesses are one of the fastest growing pet start-up businesses options, as pet owners are increasingly demonstrating a willingness to pay for time-saving convenience services such as dog waste removal. According to a 2011-2012 survey by the American Pet Products Association, spending on pet services is projected to increase from the $3.79 billion spent in 2011 to approximately $4.11 billion in 2012. New pet businesses may be required to take out insurance, obtain licenses or permits, or file other paperwork with the state, city, or local governments before beginning to offer services to clients. As requirements vary widely from one place to another, it is wise to check with local government and business organizations to determine what is required in each specific area. Pooper scooper businesses may be formed as sole proprietorships or limited liability companies (LLCs), and there are various tax advantages associated with each option. Consulting a tax accountant or business advisor is advisable, as these individuals can clarify which option provides the greatest advantage to the business owner. Pooper scooper businesses have relatively low overhead costs to start up. The primary start-up cost involves the purchase of equipment such as rakes, shovels, dustpans, and trash bags. Rental of a dumpster is also a possible piece of necessary equipment if the pet waste is hauled away to an off-site location and not left in the client’s waste receptacles. Pooper scooper businesses may also want to consider purchasing a vehicle to use for hauling waste and transporting equipment. A popular choice would be a pickup truck or van with a separate compartment to hold tools and waste. The vehicle can be customized to advertise the business using logo magnets or custom paintwork. Pooper scooper services are most frequently required in residential single-family homes. Waste removal services may also serve a variety of commercial accounts such as dog parks, doggie daycares, veterinary clinics, boarding kennels, an apartment or condo common areas. A pooper scooper service can either leave the bagged waste in trash cans on the customer’s property or haul it away for off-site disposal. Haul away options will have additional costs involving the fuel used to transport the waste and any possible additional disposal fees due to the landfill, sewage facility, or dumpster company. 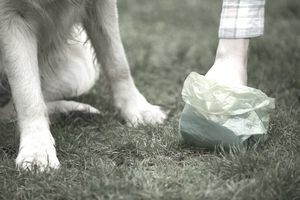 The method of disposal may be dependent on local regulations on pet waste. Other services that may be offered by pooper scooper businesses vary widely but can include the application of flea & tick spray to the yard, lawn repair for yellow spots caused by pet urine, cat litter box waste removal, or the application of yard deodorizer products. Some pooper scooper businesses also offer pet sitting services or dog walking services. On average, scooper services run about $10 to 15 for one visit per week (for one dog households). Additional fees may apply for multiple dog households or for a yard that has not had waste removal services for a considerable period. Scoopers can generally cover 4 to 6 yards per hour, especially if services are offered in a defined area. Limiting services to a specific area also saves money on fuel costs. Franchise pet waste companies, such as Pet Butler, have online pricing options based on the number of dogs, the frequency of cleaning, and owners zip code. Once a week service in my area was listed as $11 for one service each week ($47.67 monthly), $17.50 for each service every other week ($37.92 monthly), and $75 for a one-time-only visit of up to 75 minutes of hard labor. Pooper scooper services can be advertised by leaving business cards and flyers at small animal vet clinics, pet stores, dog parks, doggie daycares, supermarkets, office complexes, and other areas where pet owners may congregate. Additional advertising options include taking out an ad in the phone directory, posting ads on Craigslist, creating a business web page, putting ads in local magazines and newspapers, wearing apparel that features the business logo or applying logo magnets to the sides of the pooper scooper vehicle. Referrals can also be a great source of business; word of mouth is the best advertising there is. It may be beneficial to pursue relationships with other pet businesses such as vet clinics, doggie daycares, and dog groomers; these businesses may be willing to enter into a reciprocal referral arrangement that will benefit both your business and theirs. Satisfied clients will also be a great source of referrals once your business is established.